Coaches With No MLB Playing Experience Are Autographs Worth Collecting; Hope Is Coming! coach was a HOF storyteller! This week, baseball address king Harvey Meiselman posted some hopeful news on http://www.sportscollectors.net/. Harvey is listening to collector wishes. He noted more than one request for including coaches in next year’s Baseball Address List. Aren’t all coaches? Only those with at least a game of major league playing experience. A former player who found a second career coaching will be still be listed in the main section. He’s continued to recognize these men in the List by noting their playing debut dates. Harvey is talking about having a supplemental section as part of the list just for these coaches without a day of MLB playing time. He cited Cincinnati’s Mark Berry as an example. Harvey estimated that he’d need to invest 70-100 hours of labor to find all the living coaches from this unique category of baseball history. Think Mike Quade, before he became Cubs manager. I learned what rich sources of history these forgotten men are when I wrote Remember When: A Nostalgic Look at America’s National Pastime (Metrobooks, 1996). 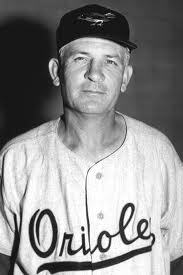 I tracked down career minor leaguer Albert Linder Vincent, who joined the Detroit coaching staff in 1943. Vincent wrote me a multi-page letter telling about his career. In 1938, as a Texas League manager, he had his batters wear football helmets for 5 innings (years before the majors adopted batting helmets). Baltimore’s use of an oversized catching mitt to handle future Hall of Fame knuckleballer Hoyt Wilhelm? It wasn’t manager Paul Richards with this brainstorm, but Vincent. The partial list of players he coached in the minors is impressive: Dizzy Trout, Virgil Trucks, Hal Newhouser, Fred Hutchinson, Wally Post, Joe Adcock, Alex Grammas, Joe Nuxhall. Future managers Danny Ozark and Mayo Smith played for Vincent. Vincent added, “You would have to ask them if they were aided by my efforts.” Seeing the many winning teams he led, I know the answer. He died in 2000. I want to give all the Al Vincents credit. I want to write to them all. Please, Harvey. Help us find them, while there’s still time to save these stories.